Happy Friday, dear readers! I don't now about you, but this week has felt like it has gone on and on and on in spite of it being a short four-day week due to the holiday weekend. I'm not even sure how that works, but I am glad to see it come to an end! I don't have anything in particular planned, although I am looking forward to the normal two-day weekend and starting up with my normal routine. Now on to today's post! If you were not already aware, today is National Nail Polish Day! I'm always sharing nail polishes here on the blog, and I naturally had to do *something* for the occasion. It has been quite some time since I've featured any nail art here on my blog, and I knew I wanted to do something artistic rather than a simple, although lovely, swatch. Even knowing about the holiday in advance, it still crept up on me and I only managed to come up with a nail art design last night when I hit crunch time. That being said, I'm pretty happy with how it turned out and I hope you enjoy it as well! I had finally swatched the Zoya Sunshine Collection again after some camera/computer issues, so the collection was fresh on my mind and perfect for my design! I'll have my review of the collection up soon, but since it has been shared by other bloggers, you likely recognize the colours used for my nail art. 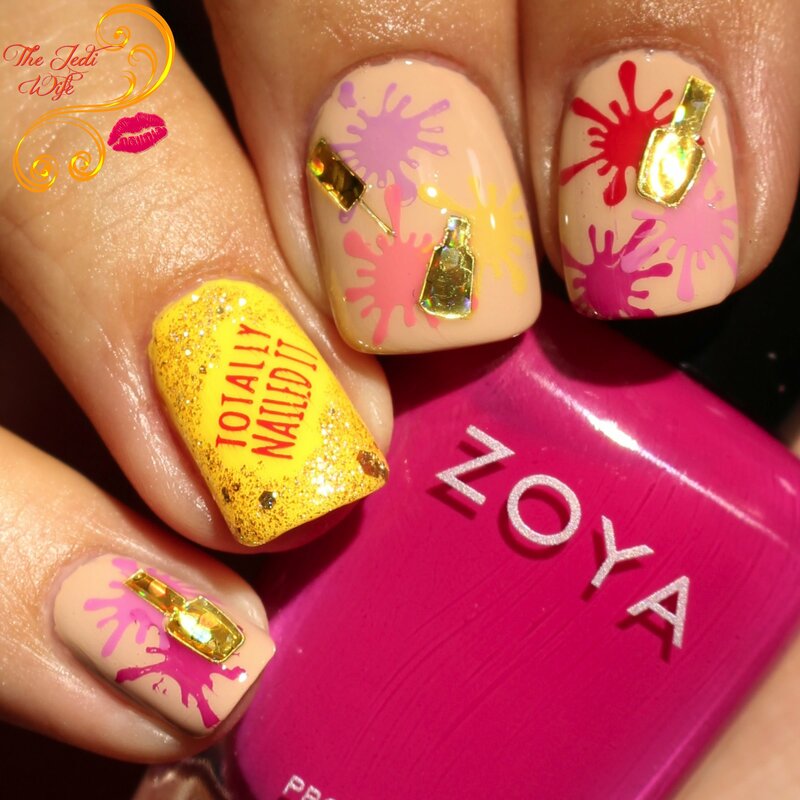 It is a pretty collection, but it did not contain a brighter yellow hue like the name "Sunshine" implies; as a result, I opted to pull an older Zoya shade from my stash and incorporated it into my design with the Sunshine Collection shades. I had meant to purchase a stamping plate with nail polish bottles etched into the plate, but sadly that never happened. Instead, I opted to go with paint splatters. I also stumbled across some old nail vinyls shaped like polish bottles and had to include them in my design! *NailVinyls is closed and no longer in business. 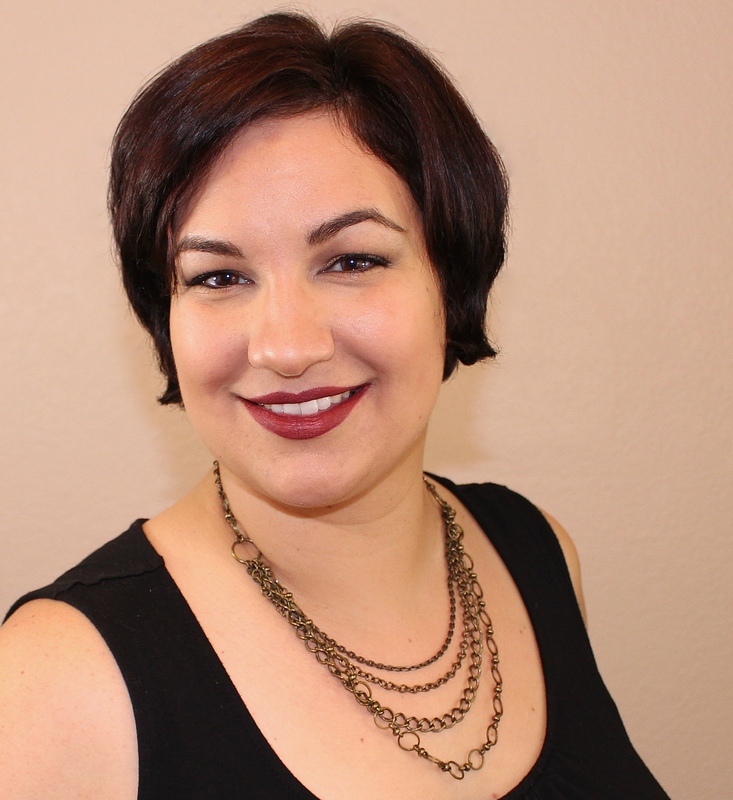 This is all I have for today's blog post! Thanks for reading and have a wonderful day! 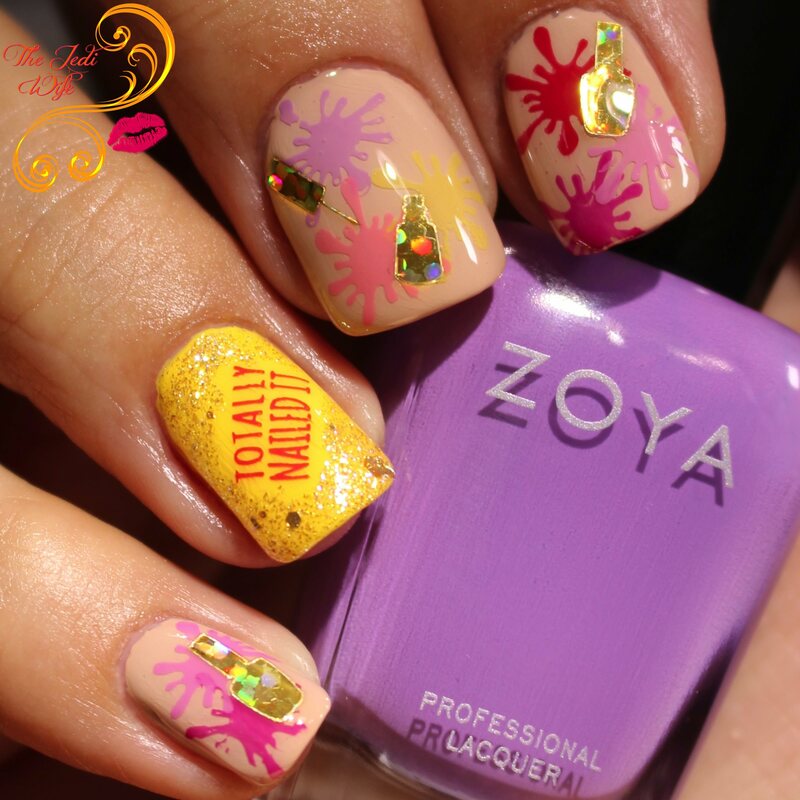 Very cute mani to show off the Zoya summer collection. I love the paint spatters! What a fun mani! I totally love the holo stickers. This is so fun! 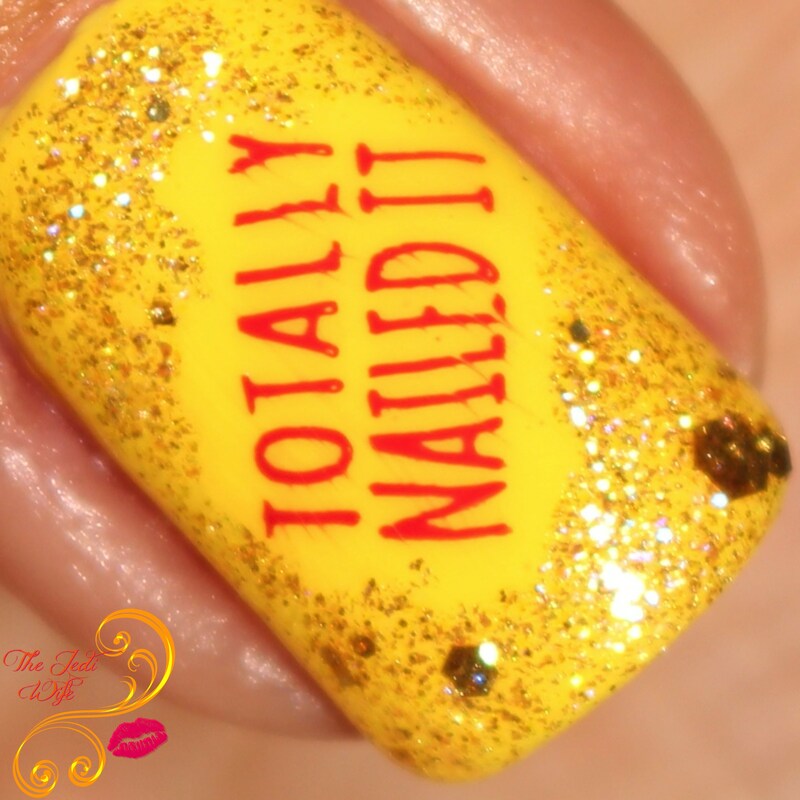 I really like the extra touch of using the glitter topper around the stamping on the yellow nail. Very clever! You totally did. This nail art is so bright and fun. This is a fun mani for a fun holiday that I’m totally on board with!!!! This is so fun!!! I love the little splashes. What a fun manicure. I did my nails today in the Great Lakes polish you so kindly picked up for me. I'd love to be able to do those splatters at the end of the week to liven it up even more. Happy Nail Polish Day!! I love that you used little nail polish glitters! So cute! Super cute mani. I love what you did. I've been under a polish rock - had no clue Girlie Bits has their own plates. Yay, happy nail polish day! This mani turned out so fun, I love it. What an adorable mani!!! Everything ties together beautifully! I love the holo stickers!! I love the splatter stamping, the colours you used there, and that completely fun accent nail. Those bottle vinyls are the cutest - they look like vintage whisky decanters. This is definitely a great way to celebrate nail polish day! These are perfect for the occasion! So cute, I love the 'splats'! I love this! It's very appropriate for the holiday. I'm impressed you used so many colors!